Comments: Lewis and Clark mentioned the least tern as they moved up the Missouri River on their keel boats. In the late 1800s, this bird was slaughtered for the millinery market as its feathers were used to adorn ladies hats. 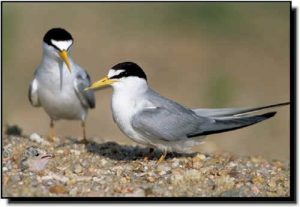 The least tern requires open, bare areas near water for nesting, such as sand bars along rivers, salt flats and even artificially cleared sites adjacent to rivers. Impoundments, channelization, river flow manipulation, beach development and human disturbance are all causes for the more recent decline of this bird whose numbers dropped 80 percent between the 1940s and 1970s. For sand bar habitat to remain suitable, occasional scouring by high water needs to occur to remove the vegetation that inhibits nesting. Efforts are being made along the Missouri River to maintain nesting habitat and nesting success through water level management, predator management and a reduction in human disturbance. In Kansas, these birds are frequently seen at Quivira National Wildlife Refuge and along the Kansas River.